This set up is ultra efficient for a small room that needs to do double duty as both office and guest bedroom. 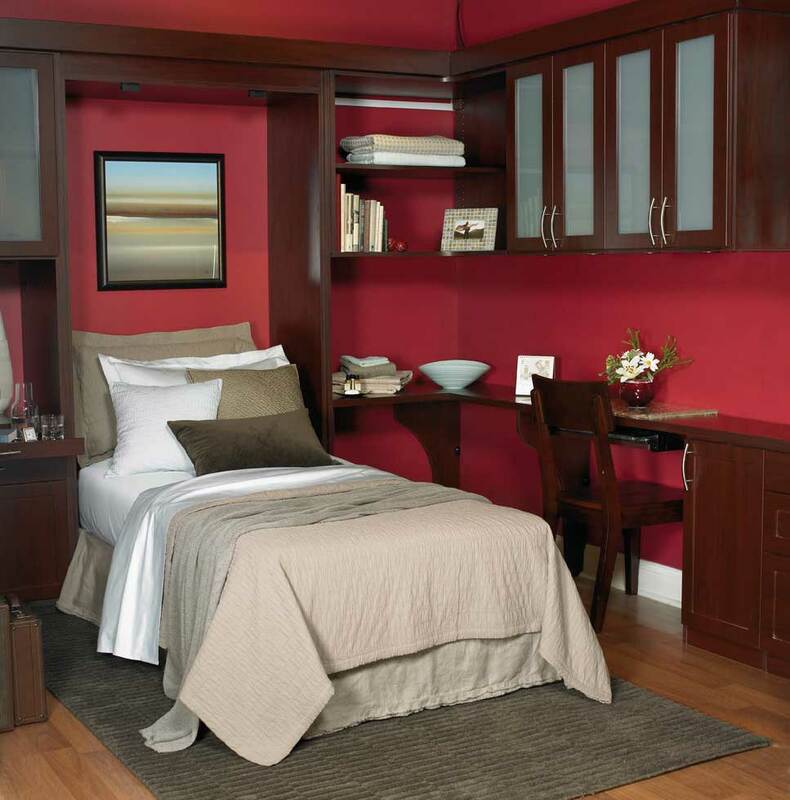 The Cocoa color system sets the tone of the room with simple, but traditional elegance. The frosted glass inserts in the doors lighten the appearance of the room, giving it an open, airy feeling that is so very important when working with small spaces. The MurphyBed stays hidden during the day behind a closed door, keeping the space all business with its focus on being a work center. The desk system wraps around a corner of the room. It includes both cabinets and open shelving for storage. A file drawer insert was included in the drawer next to the lower desk cabinet. Conveniently located to the right of the desk, staying organized in this home office is made easy by keeping the filing within reach even when the user is seated. At night, the bed can be folded out from the wall, creating a very comfortable room for sleeping, complete with a pull-out bedside table. More than just a bed in the wall, every Closet Works wallbed system features custom cabinetry that surrounds the MurphyBed. This design wraps around a corner in a small room and includes an integrated desk system with both upper and lower cabinetry in addition to the wall unit shelving system on either side of the bed. A small pull-out table next to the bed can be hidden when the space is used as as office, but opens like a drawer when needed. 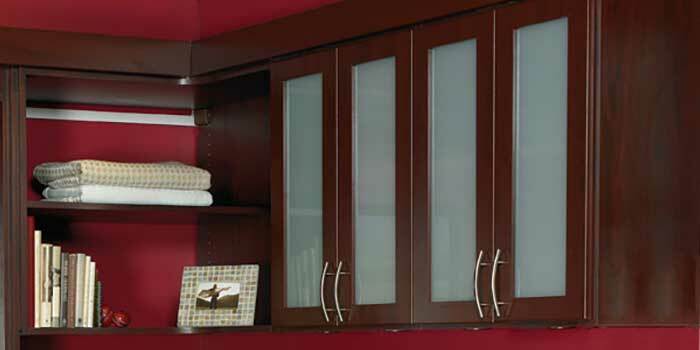 Cabinet doors with frosted glass inserts are part of the Closet Works wallbed difference — integrating an elaborate cabinet and desk system around the standard MurphyBed cabinet. Note how the rail that supports the upper shelves has been painted the same color of the wall in this picture as opposed to the open MurphyBed photo above, rendering it nearly invisible.